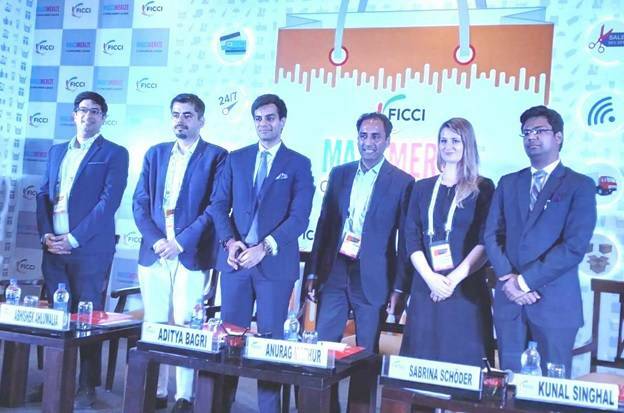 A panel discussion on Tribetailing: Leaping Beyond Mass Customization organized by FICCI in the 8th edition of Massmerize 2018 was held recently in Delhi. The discussion was a part of the daylong convention that witnessed a great footfall as important dignitaries from Government, Retail, FMCG, and E-Commerce sectors had gathered to discuss regulatory issues, Macro-Economics and consumer trends. The Chief Guest, Shri Ram Vilas Paswan, Hon’ble Union Minister, Ministry of Consumer Affairs, Food & Public Distribution, inaugurated the conference and stressed on the needs of introducing regional languages in the products so that the end consumer can understand it. Speaking on the new buzzword in retail ‘Tribetailing’, CA Kunal Singhal, MD EAZY ERP stressed that “only 10% of India is organized retail, the remaining 90% are still the Brick & mortar shops or follow traditional distribution channels. So capturing the data of this unorganized sector is also important. Opting for solution like EAZY DMS or distributor management solution, FMCG companies like MDH, Bikano, Lotus Herbals, Crompton are not only gaining a clear visibility of their secondary sales but also helping in streamlining the data management at the distributor and remote retailer level. EAZY DMS recognizes the challenges of this unorganized sector in India. Therefore, it is built in a way which doesn’t interfere in the daily workings of the distributor. It seamlessly integrates with the distributor’s billing system and provides all the required information to the principal company. He further added, “With SFA or sales force integration, retailers can book their orders to the distributors/ wholesalers bringing some order to this unorganized sector. Through such applications you can control the pricing at the distributor level”.